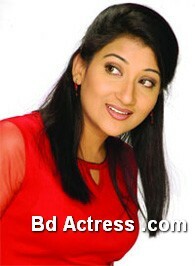 Bangladeshi actress Dipa Khondokar is acting more than one thousand dramas in twelve years of acting career. Bd actress Dipa Khondokar acting first when she is class five students. When she was pregnant she takes two years gap in media sector. She is popular for television face. Her father and mother dream was be a doctor. Dipa Khondokar was also trying for to be doctor but suddenly she join job in air plane women. Bangladeshi model Dipa Khondokar win photo beauty contest. After winning contest she enter media world. Bd model Dipa Khondokar first television model and drama was very popular. Dipa Khondokar notable dramas are Kaktoya, Sonsoptak, Kothay kew nai, Moyuya, Chalka kotha, Gohin, Nongor etc. Dipa Khondokar is also a dancer. Dipa Khondokar is model of twelve products. Her first television model is Lipton Tazza tea. She travels more than fifteen countries. Her husband is Sayed Ali. Dipa Khondokar has a three years daughter.